Bright and airy, guests will enjoy the updated kitchen, with granite countertops, tray ceiling, newer cabinetry and appliances. For those that enjoy cooking on their vacations, utensils and cookware are provided. The living area provides ample seating, with two comfortable couches and chair, positioned so you won't miss one moment of the beautiful beach scenery before you. Step outside to the large, private balcony that offers ample space for relaxing in the sun or dining al fresco. The master bedroom provides a comfortable retreat with one king sized bed and access to the private balcony, where the waves are guaranteed to lull you to sleep. The second bedroom has two full sized beds while the third bedroom has one full sized bed, making this the perfect residence for larger families. The two bathrooms provide generous space and are, like all SunHost properties, spotlessly clean. Linens, extra towels and pillows are provided. 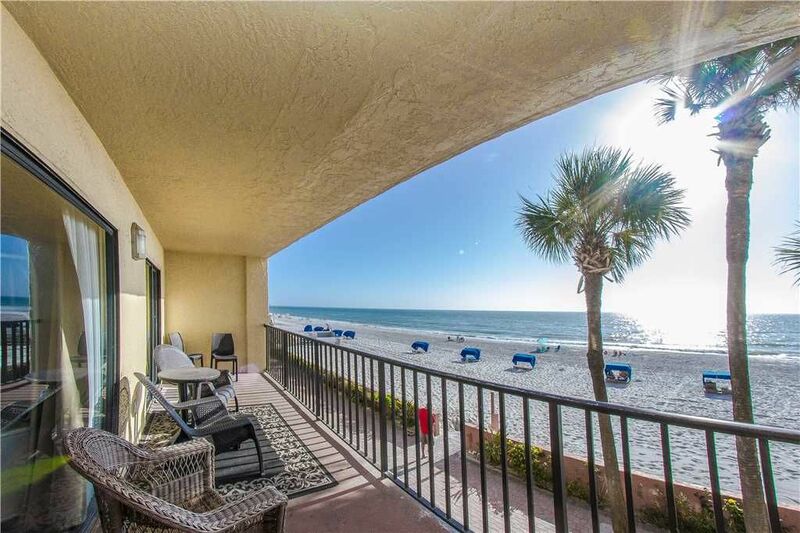 This prime condo is just one mile away from popular John's Pass Village. The Pass is a quaint turn-of-the-century fishing village and Pinellas County's #1 tourist attraction. The Village has over one hundred unique shops, a variety of restaurants, the local fishing fleet, dolphin watching and shelling tours, boat rentals, parasailing and jet skiing. Best of all as a SunHost customer you can walk to this great entertainment destination. Anchor tenants include Bubba Gumps, Hooters and Hubbards Marina and also world famous Bamboo Beer Garden. As a SunHost guest, you will have access to office services, including fax, copy, and printing boarding passes. Seven day a week maintenance service is available as well as an after hours emergency on call person. This is a non smoking home. This facility and condo need major improvements. -bedroom carpets were filthy gross and the original. Likely 20+ years old. I wouldn’t walk on them barefoot. -the showers need replacing. Old old old and gross. I felt dirty getting out. Water pressure was almost nonexistent. -the patio was gross and needed scrubbing. Full of dirt and sand. Paint chipping all over the rails. Patio rug was absolutely filthy. -we had to move some beds a bit and furniture due to me kids toys etc, the amount of filth and dust that was witnessed made me want to run. Totally unacceptable. -the pool is in the shade until 2pm. -the pool bathrooms, OH MY WORD. Your better off sparing yourself and going in the ocean. Unacceptable. -only positive I have is the view. -would not recommend this to anyone, nor would I stay here again. -I am not asking for fancy here, just CLEAN and well maintained and this place is certainly NOT. Did not like one parking. When I booked this unit I was never told that it was under construction. I received an email a few days after I paid for the rental saying “There is currently construction on the property do that the pool was also closed due to construction!”And to call THEM tomorrow ! I insisted on a discount and it was granted. So upon arriving we discovered that there is only 1 parking space for our 3 bedroom rental! AND the construction workers had a huge bin, portable toilet a tons of debris in OUR parking spot! We had to park in another spot risking getting towed. When the other half of our group arrived they had to pay $25 to park 1 1/2 miles down the street. The construction work on the balcony was completed but there was constant banging each day and on day I’m walking in the kitchen in my underwear and one of the workers jumps down from the out of nowhere from the lift and is just standing there!!! Horrible silverware and cookware. The owner never contacts us. Should be ashamed of not investing in this plsce. We paid $135 cleaning fee and the floors were filthy sand on the carpet. Really dissatisfied. Imagine our surprise to find upon arrival that a 3 Bed/2 bath condo only comes with one parking space and it was being occupied by a construction trailer. Thankfully we were assigned another spot the next day, but only after a night of worrying that we would be towed. We had to go to city hall and purchase a $25 one week pass for our second car to park in the city beach parking lot 3/4 mile away. Also be aware that there is currently construction going on at the property so you might want to check that the pool and your balcony are accessible. Great location and view. That’s about all! Furniture very uncomfortable. Dishwasher did not clean dishes. Other than that, kitchen nice except for silverware, mismatched cheap and scarce. 2nd bedroom with two beds, sheets wayyy too big and bedspreads very small. No drain inserts in sink or tub in small bath. Sweeper put out more dirt than it took in. Nice location, nice layout, just needs a good overhaul. Plunger very important in master bath. Across the street from John's Pass village and boardwalk. Near Busch gardens, Fl.